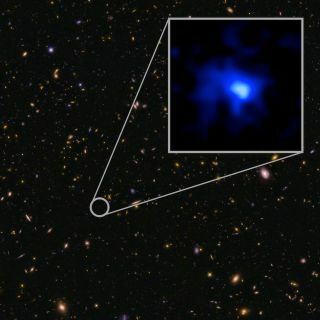 The farthest confirmed galaxy to date, EGS-zs8-1, imaged here by the Hubble Space Telescope. New measurements taken at the W. M. Keck Observatory show that the galaxy lies about 13.1 billion light years from Earth. EGS-zs8-1 is one of the brightest objects observed in this region, which is around 13 billion light-years from Earth. The authors of the new research say other galaxies likely lie at similar distances or even further from Earth, but they are too faint for scientists to measure their exact distance. "We have a lot of sources that we can see with Hubble that are probably farther way" than EGS-zs8-1, said Pascal Oesch, a postdoctoral researcher at Yale and lead author of the new study. "But we cannot measure their exact distance yet." To measure the separation between Earth and a far-off cosmic object, astronomers often look at how quickly those objects are moving away from Earth. The universe is expanding; space itself is growing like a balloon or a loaf of bread in the oven. Objects in the universe thus move away from each other, like raisins in the bread dough. As these objects move away from Earth, the light they emit becomes shifted. The more far-flung an object is, the faster it appears to move away from Earth, and the more the light is shifted. So, by measuring the degree of shifting — known as "redshift" — astronomers can also measure distance. A higher redshift equals a larger distance, and galaxy EGS-zs8-1 has the highest redshift ever measured, according to the new research (the previous record holder has a redshift that is only slightly smaller). Galaxy EGS-zs8-1 was originally identified by the Hubble Space Telescope and the infrared Spitzer Space Telescope, and stood out because of the unique colors it emitted. The new research used observations conducted with the MOSFIRE instrument on the W.M. Keck Observatory's 10-meter (33 feet) telescope in Hawaii. The unique colors observed in EGS and other early galaxies by the Spitzer Space Telescope present questions about what took place in these primeval environments. According to the statement, these colors could have been caused by the rapid formation of massive, young stars that interacted with the primordial gas in these galaxies. Oesch said further study of the galaxy could reveal the types and amounts of heavy elements that formed there. "By looking at different galaxies as a function of time, we can reconstruct the build-up of the heavy elements that we see around us today and that we're all made of," Oesch said. In addition, the new observations provide "an indication of how the stars were forming at these extreme distances, and they seem to be forming differently than the local universe. Every discovery opens up a whole new set of questions." The research appeared online today (May 5) in the journal Astrophysical Journal Letters. A pre-print of the paper can be found online. .